The Ninja 650 has been a solid machine capable of many things, but motorcyclists always seem to have mixed opinions about the bike. As much as it was praised for its abilities as a good all-round motorcycle, the Ninja 650 also faced some criticism. Yes, it was excellent as a commuter or tourer, with a lot of comfort, easy performance and reliability. But many found that the performance and handling were not sporty enough to engage the experienced rider. Now, with the all new Ninja 650, the third that we have had in India, Kawasaki seems to have pushed hard to deliver on the needs of the rider. Have they? You bet! Styling is a lot more cutting-edge, like the ZX-10R. Headlights sit lower, and the design is a lot sharper, making for a much better looking face, especially with the little ‘lip’ below the headlights. At 1135mm, the bike’s overall height is lower too, down from 1180mm earlier, making it look sportier, particularly thanks to the lower fairing and floating flyscreen. I wasn’t fond of the older bike’s camel hump-like fuel tank and I must say the new one looks a lot more pleasing, and isn’t as tall, and is flatter at the top. The sense of bulk associated with the older bike is gone, as it looks a lot more compact from all angles. Handlebars are a one-piece unit, even though they are designed to look like clip-ons. Clocks are completely new and a lot better looking, thanks to a cleaner layout and larger display. Tell-tale lights flank the centrally placed tachometer on the left. The new Ninja 650 also gets a gear indicator along with a shift light -- yet another hint at its sportier appeal. The shift light is adjustable, and the tachometer needle also changes colour as revs go up, going from white to pink to red as you approach the redline. The bike continues to use an underslung exhaust which does not sound very different from the older unit. There’s a lighter, better sounding Akrapovic exhaust on offer too, as a part of accessories that will be sold through dealerships. The ungainly looking grab rail at the rear and large ‘saree’ guard are a definite eyesore, and should be disposed of as soon as you take delivery of your motorcycle. The LED tail light is shaped as an ‘X’ and looks eye catching. Most importantly, the new Ninja 650 is a whopping 18kg lighter than before, courtesy the new, lighter trellis frame, and lighter and more stylish looking swingarm. The rear monoshock suspension is a new unit that now gets a horizontal linkage, as opposed to the earlier one that was mounted onto the frame directly. Lighter wheels, engine and various other parts also contribute to the weight reduction. Apart from plain black and green, the bike will be offered in a KRT edition as well, with a paint scheme inspired from Kawasaki’s race bikes. Will it be a pain in the back?! There are several interesting clues about the Ninja 650’s attitude. The seat height has been dropped from an already reasonable 805mm to an even more accessible 790m! This should make the Ninja 650 easier to handle for shorter riders. And when you couple that with a kerb weight that has been reduced by 18 kilograms, you know the new Ninja 650 will be much easier to manage. Nonetheless, at 193 kg, it sits heavily on the weighing scales. Then there are those single-piece handlebars. Yes, they look sporty, and they have been lowered by 42mm. The riding position is still fairly commuter-ish and upright though, and feels relaxed and doesn’t load up your wrists. The footpegs have also been lowered by 15mm as well to ease up the seating position. Looks sporty, is comfy, goes like...? Powering the new bike is an updated version of the same 649cc, liquid-cooled, parallel-twin cylinder engine. The motor is mated to the same six-speed unit as before but now gets an assist and slipper clutch as well, to help ease hopping of the rear during those hard downshifts at high revs. Clutch action at the lever feels lighter, and though our ride was extremely short, spanning just a couple of minutes, the gearbox seemed to offer positive shifts. The motor produces 68PS of power at 8000rpm and 65.7Nm of torque at just 6500rpm, the same as before. In effect, power delivery hasn’t changed. This means rideability at low speeds is great and you don’t need to change gears too often, just like its predecessor. We got just a couple of minutes in the saddle, and the performance at low to mid revs felt strong, just like the older motorcycle. Our test bike had some bit of vibration coming in from the footpegs, though only a longer duration in the saddle will help us assess the new bike’s NVH characteristics better. Our test ride was also too short to comment on the ride quality or improvements in handling, though the front end felt lighter and more communicative than the older bike. One of the most important additions is ABS. 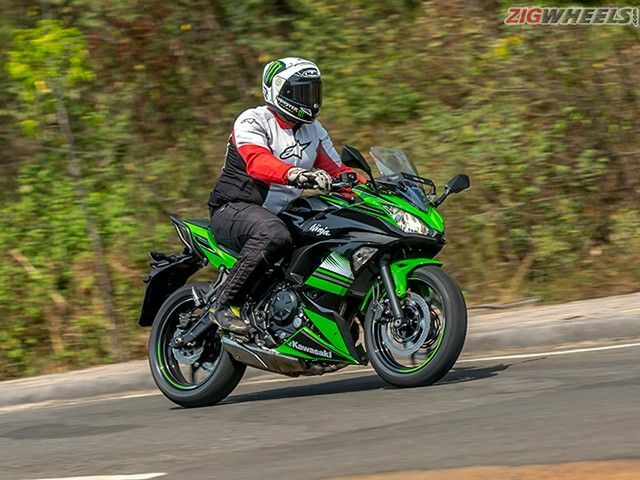 The Ninja 650 is a reasonably powerful middleweight motorcycle, and ABS should make it more confident in terms of braking, especially when braking from speed or on tricky surfaces with safer, surer stops. The new Kawasaki Ninja 650 is priced well at Rs 5.69 lakh, ex-showroom New Delhi. On the face of it, the changes do make it a better proposition for someone wanting an easy-going middleweight sportsbike, though only a full test will allow us judge its packaging better. Share your experiences with Ninja 650?